Escape to the beach with your entire extended family, group of friends, or colleagues, in this amazing 10 bedroom oceanfront home. You will have plenty of space with this multi level 10 bedroom home, a rooftop deck, oceanfront balconies, beachfront patio and semi-private beach/sand area, private spa, barbecue, wall unit AC and more!! This is a perfect home away from home, with great character. 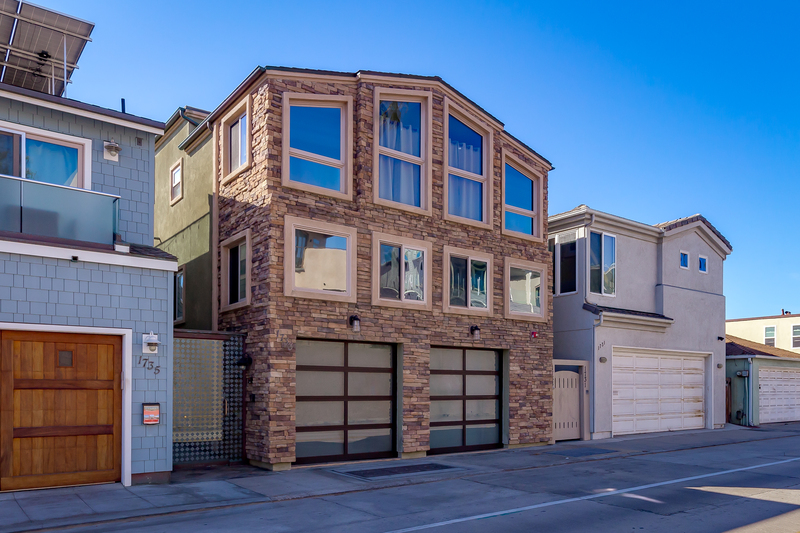 With 4 stories of bedrooms and living space, there is something for everyone, not to mention the great Pacific Ocean outside your back door. Overflow parking is available at our office in Oceanside, located at 1640 Oceanside Blvd, Oceanside, CA 92054. Besides the amenities of the home, you'll fall in love with the laid back beach town of Oceanside. The vast ocean views and sand, year-round beautiful climate and adorable downtown attractions make it the perfect setting for a beach getaway. After falling asleep to the sound of rolling waves, you'll awake refreshed and relaxed. Spend your days at the beach, or explore the other coastal attractions Oceanside has to offer. Check out the California Surf Museum, or take a stroll down the Oceanside pier at sunset. You could even take a sailboat out on the harbor! And when it comes to meals, variety abounds, no matter what you're in the mood for. Spend the evening in a cozy cafe (ie: Buccaneer Cafe), or enjoy a decadent meal at one of Oceanside's many quality restaurants (ie: 333 Pacific). Your vacation rental is also ideal for whipping up a home-cooked meal. What could be more enjoyable than preparing a hot meal with friends and family while you sip a glass of wine and watch a gorgeous sunset over the balcony of your beachfront home? During your stay, this home will become yours, and your comfort and convenience is our top priority. There is nothing like falling asleep to the sound of the rolling waves of the Pacific Ocean in one of the professionally decorated bedrooms. The home is stocked with everything you'll need at your fingertips - beach towels, linens - even spices and cooking gadgets. We want you to have everything you need to cook as much as you'd like during your stay! Our homes on the beach are where memories with family and friends are made! Need more inspiration? Check out some testimonials of others who have stayed with us - hear what they have to say about the experience, and don't forget to check out the photos guests have taken during their stay! We had a group of 16 golfers ages 30-60 and all thoroughly enjoyed staying at the beach house. Attention to detail was evident upon check in. The house was clean and had all the comforts of home that are sometimes forgotten with other rentals. The kitchen was well equipped, the beds were comfortable, all mechanicals functioned properly. We look forward to working with Beachfront Only Vacation rentals in the future! Huge beautiful house ON the beach with ocean views from just about every room it seems. Fully equipped kitchen. Very clean, modern, and well maintained. The only thing to complain about is that when you are that close to the ocean, it is kind of loud with the windows open. Our company rented this house for a meeting with 9 employees. It was the perfect amount of space for privacy and we held our meetings in the open living area on the main floor. The location of the house was extremely convenient to walk to stores and restaurants as needed. Parking was a plus too! great for large family get together. Wonderful weekend in a beautiful place. The weather held out as well! The house was awesome! Clean, spacious, modern, perfect! The ocean views were spectacular. The kitchen was well stocked. The hot tub worked wonders. The waves were fun. I received many many compliments from my guests. Highly recommend. Great house, great vacation, great location...3x over! We just finished another family vacation at this same house, three years in a row. Never an issue, never a disappointment! Beautiful and spacious, on the beach. It was perfect for our family get-together. Nicely laid out. Beautiful views. Full kitchen. Room for everyone. Everyone in the family thought it was an incredible place. Absolutely incredible experience for our family. This is our 4th time to return to this same beachfront property. Our ages have ranged from 6 weeks to 60's. Everyone keeps wanting to come back to this place. I rented this house for a 15-person writers retreat. The place was spotless when we arrived and fully stocked with the basics -- two rolls of TP per bathroom, lots of towels, blankets galore, and almost every kitchen tool one could need. Everyone time someone said, "I wonder if they have a ___," we found the item in a drawer or cupboard - blender, hand mixer, colander, corkscrew (this was put to good use). The only 'complaint', if you could call it that, was that the wide variety of spice packages provided didn't include any garlic items. This was the most disappointment 15 very different women experienced over the course of the weekend. The team at Beachfront Only Rentals was professional and patient, answering questions that were fully explained in their handy app but I was too impatient to navigate it. The space was perfect for our needs, including the outdoor beach/firepit area. We bought a bundle of wood and kindling for a nice fire on our last night (three logs are provided, but I recommend bringing/buying a full bundle plus kindling). It was an amazing end to an amazing weekend. We had a group of 20 girlfriends. We spent the weekend catching up, relaxing and enjoying the beautiful house and beach! BeachFront Only and KEY concierge were wonderful to work with. Our stay was easy, relaxing, and we'd definitely do it again. Fantastic rental with a great view in a cute beachside town!! It was so great plenty of space and very accommodating. You can't beat waking up to the ocean crashing right before you. We would definitely (and plan) to stay there again. Once again beachfront hit a home run for us for the third time. House was perfect. No issues except for the locks on the car lifts. Spoke with maintenance onsite about issue but wasn't a problem because of our experience with same type of lifts. Everything was as advertised. Already booked same house for next year so it must have been perfect. Thanks to the Beachfront team for a great experience. This is our third time renting this particular property. It has grown with us by opening up more bedrooms as our family needs have grown. Perfect for all ages from 0-70. It was the best and most peaceful vacation we ever had. A big hit with the whole family. With 17 immediate family in one home, everyone still got along great. There was plenty to keep them all busy. It was wonderful watching them reacquaint themselves with their cousins and aunts and uncles. They all live in other states so they very seldom saw each other. Again, the best vacation we ever had!!! Kudos on the beautiful home and the cleanliness of it. Few minor quirks but was handled immediately by staff. Thank you! Literally 5 steps out of the house, you are at the Beach; a few more steps you are in the Water! Our family of three generations really soaked up the sand the water all week long. The house has 4 levels with 10 bedrooms spreading from top to bottom. Most of the bedrooms have nice ensuite bathrooms. There are only 3 bedrooms that have ocean views and are pretty small with full size beds only. In general, the house is clean and comfortable. Decorations are simple and adequate, pretty in line with a beach house. The living area have an open floor plan, and plenty of seating, which make it really nice for large group gatherings. There are a few minor maintenance issues and management was quick to resolve them. Only down side is that the kitchen should be better stocked with bigger pots and lids, which we found none and basic supplies like dish cloth or sponge. On the up side, there are plenty of dishes, eating utensils and drinking glasses and mugs. In general, we are very satisfied with the location and have enjoyed a relaxing and wonderful family vacation. Plenty of space for big groups! We booked this house for a family reunion and it was everything we expected and more! The house had plenty of rooms and the beds were comfortable. It was as clean as can be expected for a beach house. It was wonderful having the spa on the first floor near the beach as the kids were in and out of it all day long. The only negative is the wifi and cell service is awful, which is probably just the location and out of the owners control. We liked the fact the house was so secure from the street, but with the cell service so bad and the difficulty some guests had getting in to the house it did cause some frustration. We had some maintenance issues during our stay, which is always to be expected and were impressed with how quickly the mgmt. addressed our issues. Huge, beautiful, well appointed and well maintained house right on the beach. Numerous rooms have incredible views. Several decks and patios facing the ocean. Parking for 5 or 6 cars. The photos and descriptions are no exaggeration. The management company, was professional, accommodating, and responsive. And it looks like they have a large variety of beachfront houses to choose from. The only other thing that would have made it the ultimate of luxury would have been our own personal chef. And it looks like you can have that too! Everybody in our large group made a comment at one time or another during the stay about what an incredible place this is. My family of 30 stayed here Monday through Friday. We had a fabulous time! The house is right on the sand, the hot tub was enjoyed by all, and there was ample space for everybody. The house was very clean, there were plenty of towels, plenty of kitchenware, and lots of bathrooms. When we needed another a/c, maintenance brought one quickly. We will definitely come back. We had a great time at the house. It was really nice being able to have everyone under one roof. The place was very clean when we came in, and things we well thought through for renters. If we had to find one area of improvement, it would be the wifi. we were a bigger group (16 of us), and none of us could get useable internet speeds. Also, Sprint doesn't get any service inside the house (but Sprint is awful, so it's their fault). everything was wonderful. The weather could have been a little better but none of us can control that. The house was beautiful and perfect for our family. We loved everything about it and will return again in the near future. Was a great stay, wonderful views and plenty of space. The parking lifts were a little challenging to work and I couldn't get one working even after I had the staff come and mess with it. Perfect getaway spot for our retreat, we had 23 guests which is how many it is rated for but the dish service was only for 20 so we had to pick up some plastic ware. Loved how many washer and dryers they had as we did a lot of laundry going in and out of the sand and ocean. Great stay and looking forward to using them again next year! I can't say enough about the vacation we just experienced with this property. We have a large family, 25 of us, and this home was perfect! From the size of the house to the location, it could not have been better. I don't know if we got lucky but the size of the beach, all day long, was awesome! We had read some reviews that others were not so fortunate because of high tides but it was really good for us. The house was very nice and clean. It had all the comforts of home you could want or ask for. The Beach Front Only team was incredible. We had a few issues that needed to be addressed and they were, usually within minutes, it was quite amazing. Our vacation was perfect and I would rent this home again in a second, and would recommend Beach Front Only Vacation Rental properties for sure! Incredible location. Nicely furnished and maintained. So much space and room for everyone. We saw a beautiful "green flash" at sunset. Was a great house for our family to gather for a nearby wedding. Lots of room. Very clean and was able to sleep everyone comfortably. Ample towels and dishes. Wifi doesn't work on all levels of home and as cell service not the best at the beach could use some additional attention. Car lift was easy to use and was great to be able to park so many cars. The location is terrific - and we always have a good time. The large table in the upper apartment has got to go...but other than that - wouldn't change a thing! What an amazing house Everything about it suited our needs We filled every bed We were there for a Change of Command Ceremony at Camp Pendelton, so there was lots of family and old friends gathering Because the location was so wonderful we all got to go off in different directions and meet back at the house for family dinners Some of th sights we visited were Disneyland, Sea World, Legeland, The Wineries, Hollywoodand of course some of the neighboring towns It was GREAT!!!! We stayed 7 nights in this home and it was wonderful...very clean and inviting. The home is enormous with enough rooms for single family privacy and large living areas for group meals and games...best week ever! This was a great trip and the house was exceptional! We had family members from the East and West Coasts gather in our 27-person-beachfront-only rental on the beach in Oceanside. The property was perfect for our family. Lots of room with 11 bedrooms. We really loved the private beach area in front where everyone spent SO much time...also the two jacuzzi's got tons of use. There are quite a few stairs (this house has five (5) levels!) and we were concerned this might be a problem for the family matriarch (92) but it worked out just fine as he stayed in the master suite on the main level where the living room and main kitchen were and then, to get to the beach he just used the outside steps which were more gradual than the inside stairs. Some bedrooms had their own baths and others had to share but it was absolutely no problem. An especially great feature was the TWO kitchens (one on the main floor and one on the floor above it). Gave us plenty of room to prepare and cook for 27 people! The rental staff was magnificent and responded to our every need. They were super easy to work with and truly wanted our stay to be a great one. I would definitely recommend this house for large group gatherings. All the generations had an absolute blast being right on the beach in such a great house! We take our 12 managers on a getaway each year. This is the third time back to this beautiful home. It is everyones favorite. We will return next year!! ITs wonderful! Wonderful location for our company retreat! Plenty of room for everyone. Beautiful views of the ocean. We will definately go back! We had family out from all over to stay for a week. The rental property was very clean and had everythign we needed. We are already talking about our next trip back. Perfect home for a large family or several families wanting to stay together. No garbage disposal in the kitchen sink seemed like an oversight and was inconvenient, and some of the furnishings are a bit tired but all in all, we enjoyed our stay. This is the fourth year we have had our annual Managers trip at this house. Each year everyone always wants to go back to this house and I am sure we will go back next year. This was a gorgeous house with the perfect location. Plenty of rooms and bathrooms for the group and space to spread out. Couldn't ask for a better place! The house and location were great, just what we were hoping it would be. The only downside was that our family was almost too big to fit comfortably into the accommodations. However, when it came time to leave, almost no one wanted to leave before the witching hour of 10 AM. A pleasant additional surprise was the automobile lifts that permitted us to park four cars instead of two cars in the double garage. This was our seventh such reunion, and I believe our family members would all rate it the best yet. Small issue getting into the house on time. Original door code did not work. Other than that, the stay was great. I was not happy that there was not enough table space for all of our group to have meals together in the kitchen/dining area. 3 to 4 people always had to sit in the couch area. it was not warm enough outside to eat on the deck. The front right bedroom on top floor shower had very little hot water for showers. I took 3 cold showers. It would be hot water for only a few minutes and then never hot again no matter were i turned the knob. The patio outside on beach level was not that inviting. no one from our group really sat out there. the weather was cool, but still the lack of flowers, or cozy feeling was not there. the sand bags were kind of ugly and it looked a little dirty in general. there was only one nice kitchen towel. i didn't think to bring more, but with a large group that was a challenge. It would have been nice to have an extra hand towel in the community bathroom the the main floor level. All in all everyone seemed to enjoy the time and the house. We had a great time. Plenty of room. House well maintained. Only complaints,, the wifi is horrible. So don't plan to do any work while here (it is a vacation house) and it could use more in the kitchen supplies. Other. Than those minor things we totally loved it. It was our second time staying in this same house. We love the ease of just walking straight on the sand and being able to talk from our balcony to our family on the beach. We enjoyed this beautiful beach rental with our children and grandchildren recently. The unit was very nice, with updated features. We had no issues that needed immediate repairs. We loved our walks on the beautiful beach and fun activities at the nearby pier. The location couldn't be more perfect. The staff at Beach Front Only was professional in every way. Would come here again in a heartbeat! We had a wonderful reunion in a lovely house right on the water. Everything went relatively smooth. A few little things missing and no gas in the fire pit or grill but was quickly remedied. this place was not in as good condition as the one 4 years ago...ran out of washer soap and trash bags; 2 lights out in track lighting; all lamps are not brght enough to read by and some floor lamps are breaking apart; nite ight in bottom stairwell not working and that is where the children slept; very dull knives; vomit behind small refrigerator in bottom room; most bath doors stick on bottom and some do not close tight; glass and cigarette butts in sand patio; wi-fi not available in all rooms; Sea Horse room window does not open; adequate supply of TP, kleenex, bath towels and beach towels. If we come back we will not take this rental. We brought a group of 20 high school seniors for their senior class trip. The house accommodated us very well. We enjoyed the immediate access to the beach and the user friendly layout. With the houses location right on the beach it was exactly what we were looking for to celebrate our 50th Wedding Anniversary with our 2 children, 14 grandchildren and 4 great grand kids. With the beach right there it was perfect for all the kids and adults too. The entire family from babies to grandparents loved this beach trip. The home was spacious and really right on the beach. This house was fantastic for our family reunion. There was a bathroom available for every room in the building, and it had great rooms and outdoor space. Shopping was very close, and the location provided easy access to everything we needed and wanted. The ocean was so much fun. The only consideration that may not be apparent on booking is the proximity of the water to the breakwater rocks lining the property at the oceanfront. When it is high tide there is no ocean level beach. The waves break onto the rocks. It wasnt too much of an issue as the kids were happy to play when the tide was out, and a sandbar in front of the property makes ocean play very fun and safe. Overall I would recommend this property.